By the 1850s a population of 300,000 sea otters was almost extinct, and Russia needed money after being defeated by France and Britain in the Crimean War. The California gold rush showed that if gold were discovered in Alaska, Americans and Canadians would overwhelm the Russian presence in what one scholar later described as "Siberia's Siberia". In any future war with Britain, the hard-to-defend colony would be easily captured. Therefore, Emperor Alexander II decided to sell the territory. The Russian government discussed the proposal in 1857 and 1858. Perhaps in the hope of starting a bidding war, both the British and the Americans were approached in 1859. 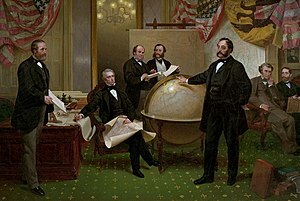 However, British Prime Minister Lord Palmerston steadfastly rejected the offer, arguing that Canada (which wasn't a country at the time and under British rule) had enough uncharted wilderness to deal with and that Britain would overstretch its resources in maintaining Alaska as well as its territories and colonies outside North America. Then the Russians offered to sell the territory to the United States, hoping that its presence in the region would offset the plans of Britain. However, no deal was reached, as the risk of an American Civil War was a more pressing concern in Washington. 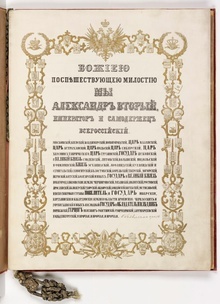 The first page of Tsar Alexander II's ratification of the treaty. This page just contains the Tsar's full style. Wikimedia Commons has a file available for full text of ratification. Gilman, D. C.; Peck, H. T.; Colby, F. M., eds. (1905). "Sealing" . New International Encyclopedia (1st ed.). New York: Dodd, Mead.